This EASY french fries recipe is a MUST try to get that fry craving WITHOUT the soaking or frying twice labor! There’s really a recipe that calls for NO SOAKING, peeling or double frying! My brother in law works in an upscale restaurant and mentioned that these fries were BETTER from theirs! They are so EASY to make because it’s a one-pot deal with NO batches or soaking involved, NOT even peeling! To good to be true? It works and it’s pretty much a hands off technique once they start frying because you don’t really need to touch them for about 20 minutes. Gold potatoes is what I used and the starchiness level may vary from potato so it’s better to stick to the Gold kind to get the best results. You only need 6 taters to make a batch of these EASY french fries! EASY, EASY, EASY Recipe and GOOD tasting FRIES! 1. Cut potatoes into 5 slices lengthwise then into 1/4″ thick strips. Place potatoes into a deep 3-inch skillet or cast iron. Pour oil over the fries and jiggle the pan from side to side to let the oil settle. Bring to a boil over high heat. 2. Once boiling leave fries ALONE, do not change the temperature or stir for 20 minutes. Remove fries with a slotted spoon and set on paper towels to drain, sprinkle with a generous amount of salt while still hot. Serve. 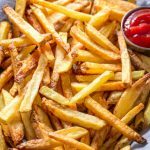 This EASY french fries recipe is a MUST try to get that fry craving WITHOUT the soaking or frying twice labor! There's really a recipe that calls for NO SOAKING, peeling or double frying! Cut potatoes into 5 slices lengthwise then into 1/4" thick strips. Place potatoes into a deep 3-inch skillet or cast iron. Pour oil over the fries and jiggle the pan from side to side to let the oil settle. Bring to a boil over high heat. 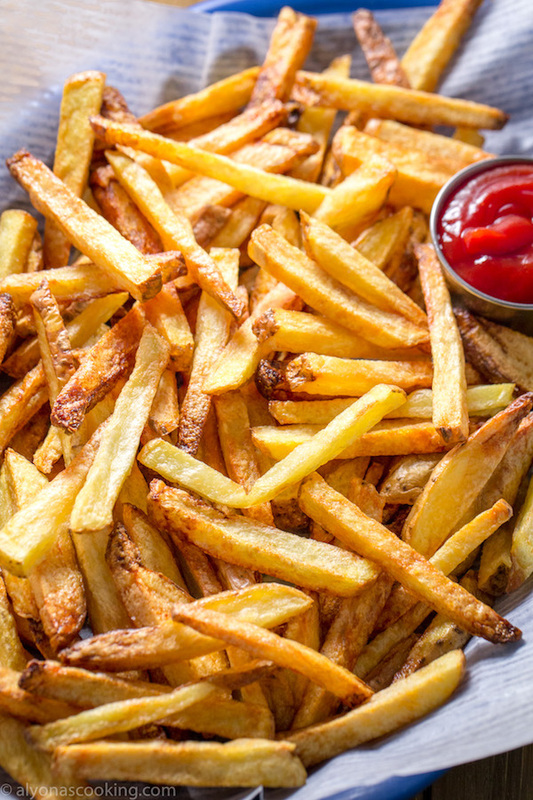 Once boiling leave fries ALONE, do not change the temperature or stir for 20 minutes. Remove fries with a slotted spoon and set on paper towels to drain, sprinkle with a generous amount of salt while still hot. Serve.